Playing Against DUI is a lifesaving campaign brought to you by SkyfineUSA and one of its Professional Ambassadors, Sebastian “Bofo” Saucedo of Real Salt Lake and the U.S. National Soccer Team. Every 2 minutes someone is injured in a DUI related accident within the U.S.
Every 50 minutes someone is killed in a DUI related accident within the U.S.
1.8 Million+ DUI’s each year in the U.S.
As a result of these facts, we have partnered up with soccer players, staff members and loyal fans who share our same vales of raising awareness in order to Kick DUI’s into the Back of the Net, once and for all! 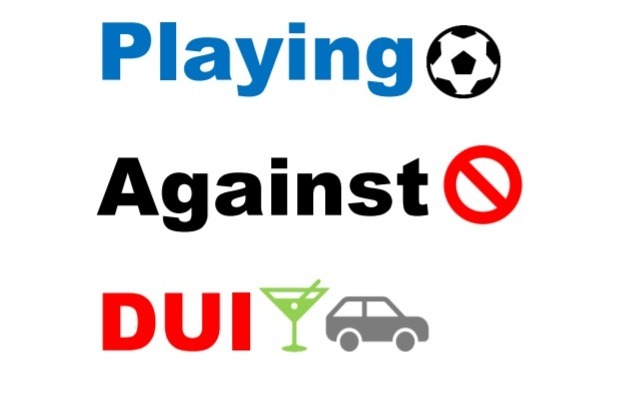 The Playing Against DUI Team (SkyfineUSA & Soccer Players Nation/Worldwide) will strive to continue educating fellow players and supporters of the hazards and consequences involved with Drinking and Driving. Not only will educational material be provided, but also lifesaving devices which allow individuals to Test Their Limit Before They Drive! The Playing Against DUI Team does not want supporters’ hard work to go unnoticed and although knowing that thousands of lives will be potentially saved through the duration of the season is the greatest gift, there are even more benefits to follow for the Winning Team of the Playing Against DUI Cup! All donations will be presented to MADD (Mothers Against Drunk Driving), which is one of the largest non-profit organizations who strives to put an end to drinking and driving! Through your donations, MADD and the Playing Against DUI Team will be able to continue making a push to eliminate all DUI Fatalities! THANK YOU FOR YOUR DONATION, JOINING THE TEAM AND HELPING US SAVE LIVES! Visit SKYFINEUSA.COM/MLS for further detail!